Pentru mine TU ai fost inceputul zborului cu parapanta – un vis pe care il aveam de peste 20 de ani, dar nu ma adunasem niciodata suficient cat sa il pun in practica. Dar m-ai ajutat TU, cu atata simplitate si naturalete de parca ne-am fi stiut de o viata. Fara vorbe inutile, fara nevoia de a-ti fi recunoscute eforturile (chiar si atunci cand ma agitam incontrolabil in aripa fiind prea entuziasta sa stau locului). DOAR FAPTE! 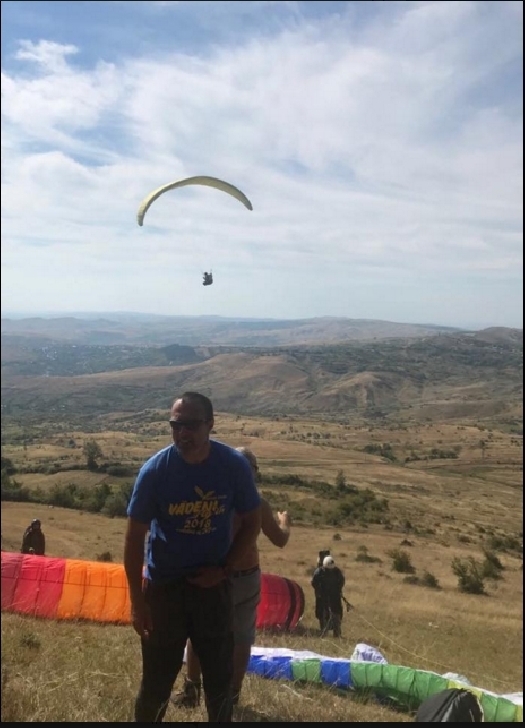 Pe langa senzatia extraordinara si greu de pus in cuvinte a zborului intr-o zi senina, cu cer radios si muuulte parapante plutind in zare, cu mici trucuri in care imi testai poate suportabilitatea, TU m-ai invatat sa-mi urmez visurile. O lectie pe care cumva o uitasem, luata fiind de valul “vietii”. 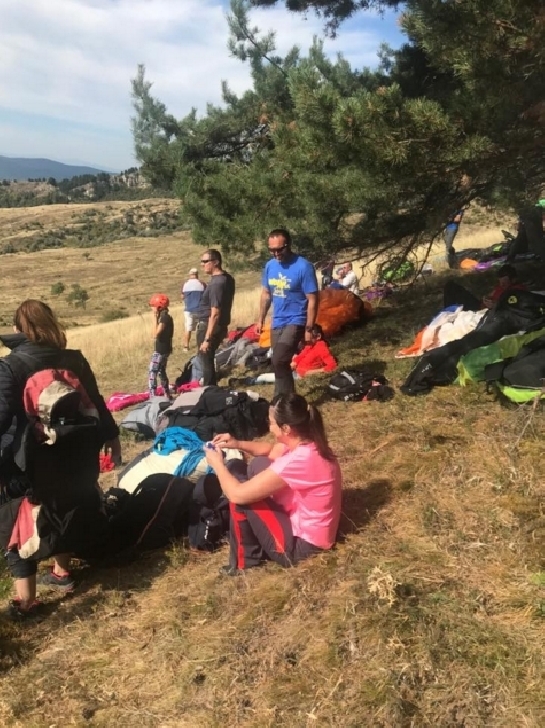 Pentru mine ai fost mai mult decat un instructor benevol de sport extrem, (profesionist adevarat, foarte calm, dar nu prea vorbaret) ai fost profesor de VIATA. Caci, da, cred ca ai trait de 1000 de ori mai mult decat altii intr-o viata intreaga. Ai lasat un mare gol, pentru ca noi, egoistii, ne bucuram de tine. Pentru ca voiam sa traim la nesfarsit clipele extraordinare pe care le impartaseai cu generozitate, cu umor si cu modestie. Mi-am amintit de o vorba ce zice ca “in viata venim pe rand si plecam pe sarite”. Tu ai facut asta de doua ori… Poate in sinea ta stiai ca va veni o data si o data clipa si fiecare zi castigata era un prilej de extaz. Pentru ca in timp ce noi ne irosim construind cariere si case, intemeind si/sau destramand familii, tu TRAIAI la maximum fiecare zi! Predand cumva indirect lectia lui “aici” si “acum”, ca un maestru zen. Ceea ce ai lasat in sufletul si in mintea mea (si cred ca si a multor altora) va dainui pe veci, pana va veni randul meu sa plec si iti MULTUMESC! Stiu ca ne vei veghea de sus si sper ca atunci cand ne vom revedea in ceruri sa pot sa iti spun “la o ceasca cu praf de stele” ca am facut cursul la randul meu si ca am multiplicat cumva in cei din jur – in zbor sau in alte domenii - bucuria enorma pe care ai sadit-o in mine. Ramai cu bine, spirit liber! Acum esti mai liber ca niciodata si sper ca vei gasi linistea si extazul pe care probabil le cautai/ simteai in fiecare salt. Zbor lin spre alte vazduhuri! Povestea scrisa de Rudi in sufletele si mintile noastre NU are sfarsit. Sau este unul deschis: vom alege fiecare sa ni-l amintim pentru ce a sadit in noi, cu chipul acela ars de soare, ochii agili, zambetul senin, intr-o combinatie aproape ireala de blandete si putere sau sa ni-l amintim pentru “sfarsitul” lui tragic si prematur? Ce credeti ca ar prefera Rudi daca ar putea alege? There’s a beginning in everything. For me, you were the beginning of paragliding - a dream I had had for more than 20 years and for which I hadn’t gathered the energy to put into practice. However, you helped me, in such a simple, natural way, as if we had known each other for years. Without useless words, without the need to have your efforts appreciated (even when I moved uncontrollably because of my sudden over excitement). Only actions. Aside from the extraordinary feeling of flying which cannot really be put into words (a clear sky in perfect weather, maaaaany paraglides floating in the sky, with your small tricks, probably meant to test my adrenaline level), you taught me to follow my dreams. A lesson that I had somehow forgotten, being carried away by “life”. For me you were so much more than a generous extreme sports instructor, flying me for free (a true professional, very calm, though not very talkative), you were a LIFE instructor. Yes, I do believe that you lived 1000 times more than other people in their whole life. You left a huge empty space behind, because we, being selfish, took advantage of you. We wanted to endlessly live those extraordinary moments that you so full-heartedly shared, with humour and modesty. Maybe deep inside you knew that the moment would arrive one day and every day you “won” was a reason for being ecstatic. While we waste ourselves building careers and houses, starting and/ or breaking up families, you just lived most intensely every day! Somehow teaching indirectly the lesson of “here” and “now”, like a Zen master. The seeds that you have planted in my soul and mind (and probably in those of many other people) will be with me forever, until it is my turn to go and I want to THANK YOU! I know you will be watching us from above the clouds and I hope that when we meet again, for a “cup of stardust”, I will be able to tell you that I have got my paragliding license and I have somehow multiplied in others the endless joy (for flying or for other domains) that you have planted in me. Farewell, free spirit! You are now freer than ever and I hope you will find the peace and the thrill that you were probably looking for in each and every jump. Enjoy the flight to other horizons! The story that Rudi wrote in our souls and minds has no ending. Or it is an open one: each of us will choose to remember him for what he has planted in us, with his sun-burnt face, agile eyes and perfect, uplifting smile, in an almost surreal mixture of kindness and strength, or we will remember him for his tragic, premature “end”? What do you think Rudi would prefer if he could choose? Ce trebuie să ştim despre accidentul vascular cerebral ?